No need for batteries—the grid is there to provide power when the sun goes down. You can still “zero out” your electrical use on an annual basis. The system is easier and cheaper to install. No system management is required. You can take advantage of “time-of-use” metering to amplify the payback of your solar system. Independence from the utility company. No utility power outages – even in winter storms. Adaptable for simple or full-amenities lifestyle. You will need to manage your energy budget. Back up generator will be required. A simple and silent way to keep your tank full. Able to pump from a well, spring or pond. Fuel-free systems providing water wherever you want it; home use, garden, ranch, pond, etc. If you have an elevated tank, no other pump is required - good old gravity. Battery systems can also provide water pressure in remote applications if you don’t have a spot for an elevated tank. ** PV- direct – pump connected directly to solar panel pumping water whenever the sun is shining. Do you own, or are you planning on buying an electric car? Let solar energy be your fuel! A grid-tied system will produce energy during the day, being “stored” on the grid for later use. You can charge your car in your garage at night using the energy from the day’s production. We can size a system to provide the amount of “fuel” you need for the car, or it can be added to a larger system to offset your household usage. Rebates and special PG&E rate schedules are available for car charging stations. 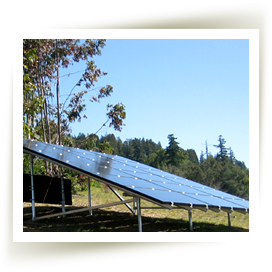 Sign up for our monthly newsletter to hear the latest about Mendocino Solar Service. 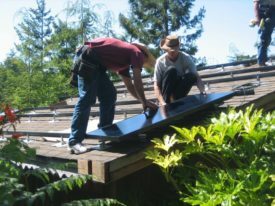 If you are considering solar-generated electricity for your home, you probably have a lot of questions. Give us a call at 707 937 1701 or schedule a free consultation online and we'll happily discuss them with you. Solar electric cells were invented in 1954 and first used in space. Check out some beautiful photographs here.